Gaming - Sierra Ent. and Stormfront Studios breathe fire into the new "Eragon" game. Features - French vfx house BUF helps Luc Besson bring his "Arthur and the Invisibles" world to animated life; The new adaptation of "Charlotte’s Web" weaves in numerous digital sequences from various vfx houses around the world; French director Michel Ocelot returns with the triumphant "Azur and Asmar". Television - The prolific stop-motion studio starts a new tradition with "Holidaze". 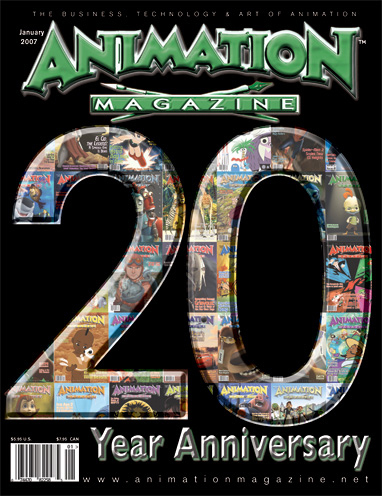 Special 20th Anniversary Section - Characters, toons, and movies that are celebrating landmark anniversaries in 2007; 40 Auteurs We Love (1987-2006) The essential list of 40 animator/auteurs who have influenced the animation and vfx scene; 13 People, Platforms and Trends That Are Reshaping Our World A list of new media visionaries and trend-setters; 20 Animated Things to Look Forward to in 2007. Oscar Watch: An ode to the year of the hyperactive CG-animation animals; Special 20th Anniversary Section.